Well, since every time I post a type of churro recipe, my blog buzzes with action, here is another one. Churro Crepes. I made these for my family one Sunday morning and I made some for the guys at my office. I received high compliments, so I thought I 'd share the recipe. Crepes are so easy to make once you get the batter right. You don't need any fancy equipment. My mom always made her crepes in a regular pan greased with good old Crisco. I prefer a non-stick pan coated with cooking spray. To each their own. I did try two different dulce de leches with the crepes. 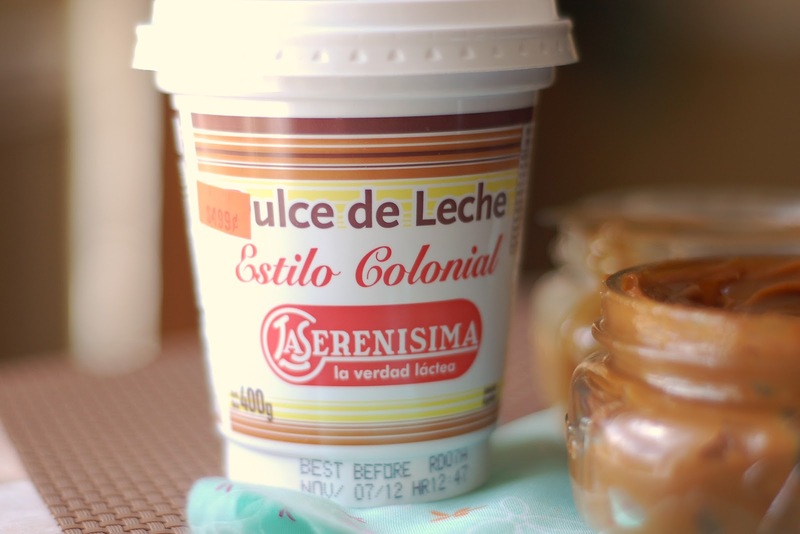 The darker dulce de leche was made by a friend. She boils her unopened can of sweetened condensed milk in a pot on the stove for about 1.5 hrs, flipping it over half way through. 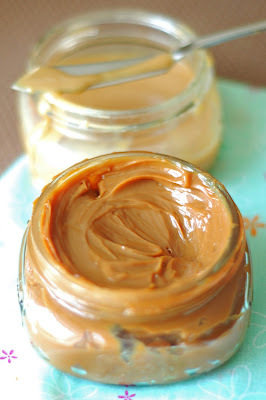 It produced a darker, thicker, and more rich flavored dulce de leche. 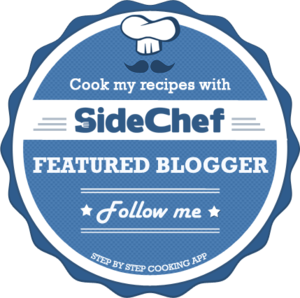 I cooked mine in a jar in the slow cooker for 10 hours (see how here). I ended up with a lighter, creamier and thinner dulce de leche. Each is equally good, it just depends on what you need it for. If you want to use it as a filling for a cake or cupcakes, the thicker one is better. If you want to pour it over ice cream or crepes, then the thinner one works better. I did like my homemade dulce de leche better with these crepes because the taste didn't over power the cinnamon flavor and the light fluffy texture of the crepe. The thicker, darker dulce de leche was just to strong for this delicate treat. For those who just don't care and are really not interested in making their own dulce de leche, here is the brand I have used for other recipes. It is dark and thick like the one my friend made. You should be able to find it at your local Spanish market. If not, you can try La Salamandra brand on Amazon.com. In a blender or with hand mixer, combine all ingredients. Blend until smooth. Heat a nonstick skillet with flared sides over medium-high heat. Remove from heat. Pour 1/4 cup batter into skillet; lift and tilt the skillet to spread batter evenly across bottom of skillet. Return to heat. Cook about 1 minute or until light brown. Flip crepe with a spatula and cook the other side for about 30 seconds. Remove from pan and place on a warm plate and cover to keep warm. 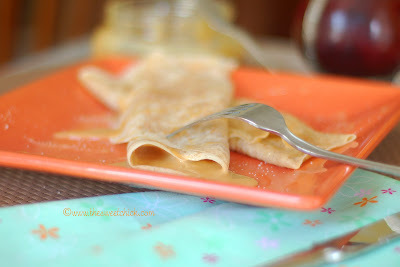 When all crepes are cooked, fill them with 3 tablespoons (or more if you like) of dulce de leche and either fold the side of the crepes into the middle or roll up the crepes. Sprinkle 1/4 teaspoon of cinnamon sugar over the top of each crepe.